Two-pack Little Mashies reusable 130ml food pouches in orange. Fruit purees, smoothies, yoghurt, blitzed vegetables and casseroles … the possibilities are endless with Little Mashies reusable food pouches. This pack features two orange 130ml food pouches. 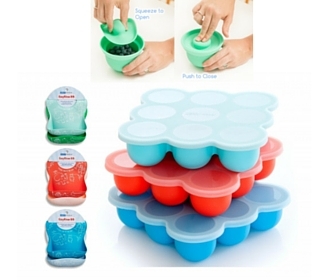 They have a unique curved design for easier cleaning and a wide, 11cm anti-leak ziplock at the base so they are easy to fill and also very strong. Perfect for daycare, rides in the car or even just storing food at home, Little Mashies are BPA-free and freezable. They’re also easy to clean – just wash with a bottle brush and warm soapy water.